Fitness expert, former model and former London school teacher Brian Keane’s new book, ‘The Fitness Mindset' has achieved eight weeks at the top of the Amazon bestseller’s chart. Firmly holding its place in the ‘Nutrition’ category, Brian’s new book also reveals tips on improving fitness and how to achieve a mindset to overcome obstacles such as anxiety and stress. Brian Keane suffered from anxiety while working as a school teacher. He found himself having sleepless nights and consistently worried about his performance at work. For four years Brian worried about his sleep pattern and his working life, which resulted in him consuming sugary foods and drinks to maintain his energy. Brian said, “I always thought anxiety meant that you didn’t have your life together - regardless of what you may see, nobody has every area of their life together - and my only experience with anxiety was when colleagues would get signed off work due to stress. The Fitness Mindset addresses different tactics Brian has discovered when working to overcome his own anxiety, below are some of the top tips he has discovered. Recognise the source of your anxiety. ‘Find the source, fix the problem.’ For some of us, it is as simple as cutting off the source of anxiety. In my case, there were certain people in my life who just made me feel ‘off’. I felt more insecure around them, and even though I called them friends, in truth, they weren’t. If there are people in your life that make you feel this way, I recommend minimising the amount of time you spend with them, or cut them off completely. Sometimes, it’s as simple as finding the people who make you feel happy and spending more time with them. Train, exercise or meditate. For years, I used the gym and my training as an outlet, so they always acted as plasters that temporarily healed the problem. If I felt I was on the edge, I never dealt with it or asked myself who or what was making me feel this way. I just went to the gym. I was effectively ‘self-medicating’ with exercise. In my opinion, it’s actually the best way to reduce short, as well as long- term anxiety, but it’s imperative to follow step one and then use training, exercise and meditation as ways to support you and not just put a lid over the real problem. Don’t eat foods that make your anxiety worse. Knowing how certain foods can send my body into a spiral of ‘fight or flight’ has helped support me massively over the past few years. If your body is intolerant or allergic to certain foods, or if you react to certain additives, flavourings and preservatives that can be found in heavily processed food, then it’s worth keeping note of how you feel if these ingredients feature heavily in your diet. For example, I know if I eat too much dairy, sugar or gluten, my brain will feel foggy the next day and I won’t have the same steady energy and mood that I normally have. Everyone reacts differently to certain foods and ingredients, so experiment with it yourself. anxiety issues anymore. If you still find yourself getting edgy and anxious for no apparent reason – it’s not about money, a relationship or a job and you just feel ‘off’ – then I highly recommend having a look at your nutrition and checking if certain foods you consume are causing you to feel this way. Brian Keane’s new book ‘The Fitness Mindset’, published by Rethink Press, is available to order on Amazon at £11.99. The book, that became an Amazon best seller its first 24 hours of sale, reveals the best tips and strategies improve your health, lose weight and maintain the mindset to reach your body goals. Brian Keane is available for interview. If you would like to speak to Brian please contact Mary-Jane Rose at Famous Publicity at mary-jane@famouspublicity.com or Tina Fotherby at tina@famouspublicity.com or call the office on 0333 344 2341. 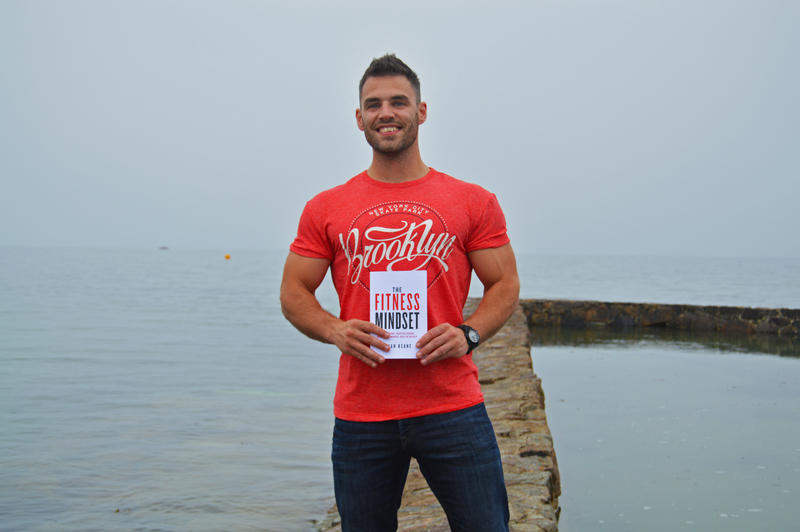 Author of new book ‘The Fitness Mindset’, Brian Keane is a fitness trainer, former professional fitness model and the owner of Brian Keane Fitness. He has an impressive online following with over 66,200 Instagram followers, 69,000 Facebook fans and hosts one of the top fitness and nutrition podcasts on iTunes (http://apple.co/2tJc3Fp). Aged 9, Brian became inspired by body-builder and actor Arnold Schwarzenegger and began his fitness journey. On his 16th birthday, he received his first gym membership as a gift from his parents and has been training ever since. Brian later went to university and received an honours degree in Business. In 2010, he moved to London and became a primary school teacher while running a personal training business simultaneously. In 2014 Brian left teaching to develop his career in fitness. In that year, he won the Fitness Model Pro Card at the Miami Pro event which kicked off his international career as a fitness model. In May 2015 Brian’s daughter Holly was born. Brian divided his time between his daughter and building a business to serve people from all walks of life on a global scale. Brian’s online fat loss and muscle building training programs focus on helping people improve their fitness through short high intensity training sessions and nutritional strategies that suit their lifestyle. ‘The Fitness Mindset’ book, due to be launched this Summer, incorporates 17 years of his training and nutrition experience with nearly 30 years of his life journey. The first section of the book focuses on how to get into shape and achieve body goals. The second section provides advice on dealing with problems such as anxiety, stress and worry. Crucially it shows readers how to maintain fitness by changing their mindset. Brian Keane now lives in Galway, a beautiful harbour city on Ireland’s Atlantic coast, known as Ireland’s cultural heart. This press release was distributed by ResponseSource Press Release Wire on behalf of Brian Keane Fitness in the following categories: Children & Teenagers, Men's Interest, Health, Leisure & Hobbies, Women's Interest & Beauty, Sport, for more information visit https://pressreleasewire.responsesource.com/about.